Students in a graduate seminar led by Professor and Canada Research Chair in Philosophy of Perception Mohan Matthen. Photo: Johnny Guatto. Philosophy has been taught at the University of Toronto since 1843. Much has changed in that time, but the department remains Canada’s preeminent philosophy department. Across all three campuses (St. George, UTSC, and UTM) it is an international leader in history of philosophy – especially ancient and medieval philosophy – as well as ethics, philosophy of science, and philosophy of mind. In all of these fields, department members take contemporary philosophical problems and their historical antecedents to illuminate one another. The department’s most distinctive strength is its broad coverage of the history of philosophy. 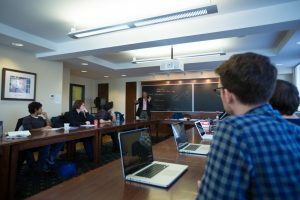 While our peer departments usually have one or two experts in a few historical periods, U of T has specialists in every area of the history of Western philosophy, as well as in aspects of the history of non-Western philosophy. This historical focus engages with other areas of strength: ethics (broadly construed to include both continental and analytic approaches, and to encompass such subfields as philosophy of law, political philosophy, and bioethics), philosophy of science (including logic and, especially, philosophy of biology), and philosophy of mind (including cognitive science). Many Toronto faculty working in these areas also study their history, and use that study to inform their contributions to contemporary debates; at the same time, our historians of philosophy benefit from and contribute to groundbreaking work in systematic philosophy. This integration of historical and systematic philosophy sets us apart from other top philosophy departments, where the history of philosophy is often segregated from the rest of the discipline. Our tri-campus department’s main offices, including the St. George undergraduate and graduate programs, are housed in the historic Jackman Humanities Institute (formerly known as the Medical Arts Building), one of Toronto’s finest examples of Georgian-influenced architecture. The Medical Arts Building, originally built in 1929, was acquired by the University of Toronto in 2002. In 2008, it was re-named the Jackman Humanities Building in recognition of the Honourable Henry N.R. Jackman‘s outstanding philanthropic support of the arts and humanities at the University of Toronto. Left: a vintage postcard of the Jackman Humanities Building (formerly the Medical Arts Building); date unknown. Image courtesy of John Chuckman. Right: The Jackman Humanities Building today. Photo: Johnny Guatto. 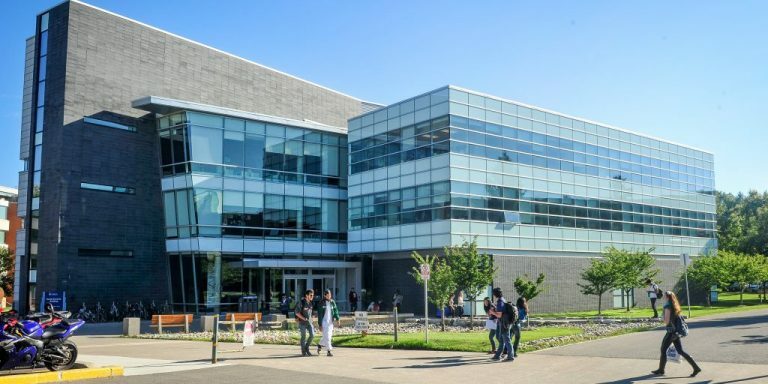 The UTSC Philosophy department is housed in the Social Sciences Building at UTSC, a sprawling modern campus known for its verdant tree-lined pathways, stellar facilities like the Toronto Pan Am Sports Centre, and location close to popular natural landmarks in Toronto’s greenest area. Born on July 1, 2010, UTSC Philosophy had formerly been housed within the Department of Humanities since the 1964 founding of UTSC. In summer 2018, the UTM Philosophy department moves to their spectacular new home: the North Building Phase B is a 210,000-square-foot, six-story addition to the existing North Building on UTM campus. Designed by acclaimed architects Perkins + Will, the new building features innovative use of organic construction materials and boasts certified LEED Gold status. Learn more about the new North Building here.